The 1976 West Lakes Classic in Adelaide was the first of the "big money" titles on the Australian circuit that year. The East Course at The Grange Golf Club in Australia's cathedral city is where Greg Norman became a household name. Norman, the 21-year old Queenslander won the $35,000 West Lakes Classic golf tournament in Adelaide by five strokes, took up golf only six years earlier. Norman, the 21-year old Queenslander who won the $35,000 West Lakes Classic by five strokes, took up golf only six years earlier. 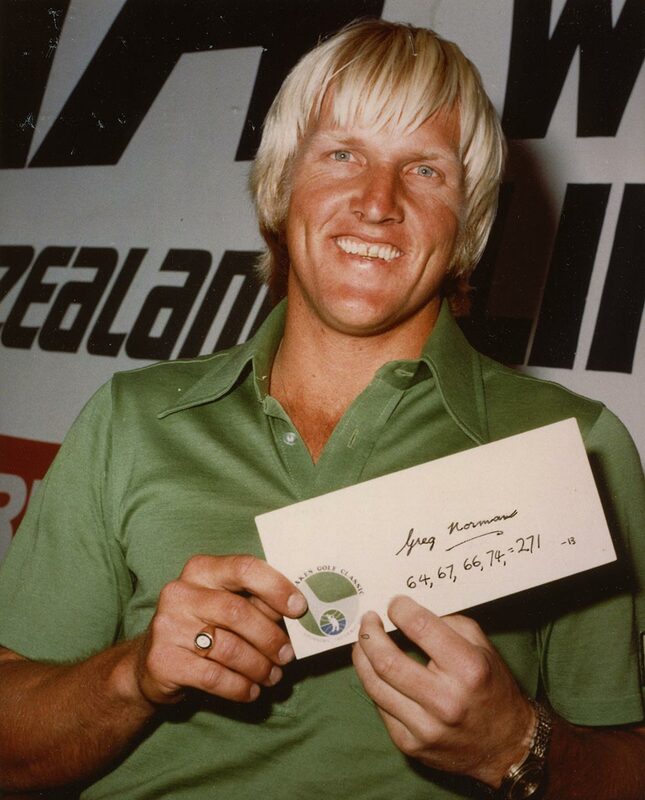 Greg Norman's professional playing career began in 1976 in a $15,000 tournament at Bateman's Bay. He finished third, and the following week finished third again in the $18,000 Australian Open in Keperra. His third entry into the world of professional golf would earn him yet another top-10 finish in the New South Wales Open. But it was his fourth event that would begin to define his career. The 1976 West Lakes Classic in Adelaide was the first of the "big money" titles on the Australian circuit that year. The East Course at The Grange Golf Club in Australia's cathedral city is where Greg Norman became a household name, and it's also a spot on Norman's golfing resume where he went from being merely confident in his abilities to knowing that he could compete with the world's best players. Norman, the 21-year old Queenslander won the $35,000 West Lakes Classic golf tournament in Adelaide by five strokes yesterday, took up golf only six years earlier. He beat some of the world's best players in one of the most stunning results on the Australian golf circuit for years. Peter Thompson, five times British Open winner, was moved to say that the lad was a better prospect than were Graham Marsh, David Graham, and Bob Shearer at the same age: "Norman has everything. His legs have been conditioned by football and his shoulders by surfing." Thompson said. "Well, I don't know about that," Norman said shyly after his victory. "I do know that I love the game, more that any other I have played. I want to be one of the best players in the world. I thought that golf was an easy game to make money at." Norman has played in only four 72-hole tournaments, and already has a brand new motorcar and $8000 in the bank. He is a brilliant sportsman. He represented Queensland at two football codes, Rugby League and Australian Rules, before turning to golf. And all the time his favorite sport was surfing. But it seems now at golf, he will outreach all past sporting achievements. He took up the game only six years ago and three years later represented Queensland in the interstate amateur series, and was one of only two undefeated players in the 1973 Amateur Championship in Perth. Norman was given a 36 handicap and it tumbled to a nine before he had a lesson. Norman has one worry -- that he might be paired with Jack Nicklaus in the $160,000 Australian Open in Sydney next week. "He's my hero. If I'm paired with him I'll probably die with nervousness." "I can't believe it." My mind is in a whirl," said Norman, 21, who shot rounds of 64, 67, 66 and 74 for a 72-hole total of 271, 13-under-par. Two of the world's best golfers, David Graham and Graham Marsh, tied for second. Norman notched 27 birdies in an incredible performance and David Graham was moved to declare: "A new star is born." Norman said he was "twisted in knots" after dropping three strokes on the first three holes. "I kept saying to myself, I can't blow it now." But he sank a four-foot birdie putt at the fourth to restore some confidence. Even so, he staggered with bogeys at the eighth and 10th holes and Graham, who had started 13 strokes behind, moved to within four strokes of the lead. "I felt a lot of pressure but abandoned my defensive play," Norman said. Norman, in fact, abandoned his negative thoughts in a most spectacular fashion, He surged back in command with four spectacular birdies in the next five holes with putts from 20ft, three feet, six feet and 10ft and walking to the 16th tee knew the championship was his. "I played the last three holes in a dream. I dropped strokes at each of them, but it really didn't matter. Thank Lord." Norman missed a putt of only one foot at the last hole for his par. "It was only a foot but I was a million miles away from it," he said. "It was a great experience winning. Now I know what to do in the future. I didn't know what it was like to win before." Norman won a $7000 check and exclaimed: "I've never had that much money before. I have a brand new car and $8000 in the bank. I'm happy." Bruce Devlin and David Graham both said they were glad Norman won after leading by 10 strokes. "It might have destroyed him if he had blown it and lost," Devlin said. "I have known it to happen to other players. One player in particular was one of the best I'd seen and he was destroyed for life after losing by a stroke."